If your business’s policy is to never provide customer quotes until multiple internal folks sign off on the quote, you understand firsthand the importance of an efficient, streamlined process for advanced approvals. Indeed, the typical sales team wastes precious time preparing customer quotes manually, sending them to each of the folks who must approve them, following up with individual approvers when a quote gets stuck somewhere along this approvals chain, and regenerating and resending quotes back through the entire chain when an approver rejects the quote. Even if you use Salesforce, the native approvals process is an inherently linear one – in other words, a newly generated quote must progress through the approvals chain one step at a time. The Advanced Approvals feature from Salesforce Quote-to-Cash (also known as Steelbrick) offers a far superior way to obtained advanced approvals on customer quotes. The Advanced Approvals chain is designed to allow for multiple, independent approvals to occur within a single approval process – in essence, allowing multiple parallel approvals, even when those approvals have different approval steps, conditions, and approvers associated with them. In this post, we’re going to explore the specific features of Advanced Approvals that provide unparalleled flexibility and options for ensuring quotes move quickly and seamlessly through an approvals chain, no matter how complex the chain may be. 1. Advanced Approvals can accommodate a nonlinear approvals chain: Unlike the linear approvals chain that are intrinsic to Salesforce’s native environment, Advanced Approval recognizes that many approvals chains are not linear and that businesses want to set up parallel approvals pathways to expedite approvals. For example, with Advanced Approvals, a quote can be submitted to a finance manager and a sales manager simultaneously (and automatically, of course). As soon as the sales manager approves the quote, it moves automatically to the sales director for approval, irrespective of whether the finance manager has approved it and moved it to the chief financial officer for approval. 2. Advanced Approvals can assign approvers dynamically: Many businesses don’t want all quotes to follow a single approvals chain; there might be differences in who approves a quote, for example, depending on whether it’s a U.S. vs. international opportunity. The native Salesforce application isn’t designed to integrate a complex set of rules regarding these dynamic approvals; however, with Advanced Approvals, a business can specify any number of rules or parameters for what circumstances trigger approvals by a particular combination of individual approvers. For example, it’s not unheard of for a business to have more than 100 approval rules! 3. Advanced Approvals can streamline resubmissions of rejected quotes: One of the most frustrating aspects of a complex approvals chain is the possibility that one approver will reject the quote, forcing the sales team to resend a modified quote through the entire approvals chain again. Advanced Approvals offers a way to dramatically cut back on the redundancies that are inherent with this process. In essence, Advanced Approvals can discern which conditions of the quote remain unchanged; when this happens, the system knows to bypass all of the approvers who do not need to reapprove the quote. For example, if legal counsel rejects a quote and the only difference in the resubmitted quote pertains to legal conditions, then Advanced Approvals will send the resubmitted quote back to legal counsel only; the prior approvals received from finance and sales supervisors will remain attached to the quote. In a fast-moving and dynamic sales environment, It’s so easy for individual approvers to fall behind or overlook the quotes they must approve. Fortunately, with Salesforce Quote-to-Cash Advanced Approvals, one weak link need not bring an entire approvals chain to a standstill. 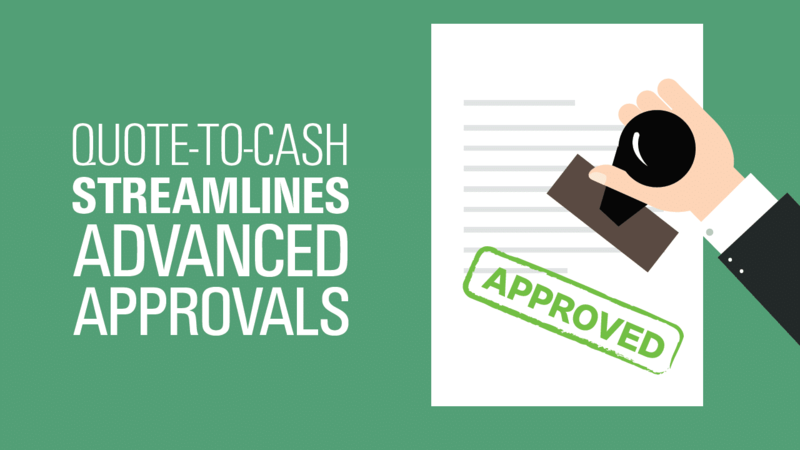 With Advanced Approvals, it’s possible to streamline the approvals process using nonlinear approval chains, approver assignments that can be adjusted dynamically, and a streamlined process for resubmitting rejected quotes.